When I met Mandy Aftel at her Berkeley studio this past spring, I had the good fortune of meeting Avery Gilbert. He was on his way out the door as I was on my way in, but he was very gracious and chatted with me for a bit. 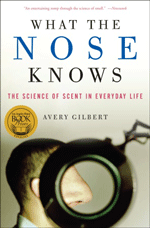 Avery Gilbert is a sensory psychologist with a specialty in olfaction. 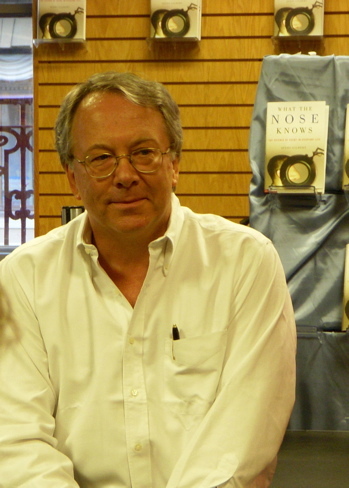 He is the author of What the Nose Knows for which he was a Los Angeles Times Book Prize in Science & Technology finalist. Scent Hive: In your book What the Nose Knows, you inform us that there are approximately 1000 chemicals in nature that we humans can smell, but there are thousands more that we can’t smell. As you say, those non-smellable chemicals might round out a scent, making it more nuanced or more complex. Do you believe that we experience odor molecules from a natural source differently than we do synthetic ones, particularly in perfume? Avery Gilbert: There are two kinds of non-smellable molecules in natural products: those we are able to smell but which are present at non-detectable concentrations, and those we can’t smell regardless of concentration (perhaps because we lack receptors for them). When it comes to a natural lavender oil, for example, we are sniffing a complex and variable mixture of molecules. The non-smellable components (perhaps intended for insects and other pollinators) are probably modulating the parts of the bouquet we can smell. A synthetic lavender, composed of the top dozen odor-contributing molecules found in the oil, will lack the ballast of these non-smellables, but most people will recognize it as lavender. If it’s really well composed, it will be difficult to tell apart from the real thing. In perfume, the aesthetic adequacy of a synthetic substitute depends on how much care (time and money) the perfumer and client care to put into it. You can have a cheap, thin, lavender impression that falls apart in a half hour, or a costly version that works like the real thing. In the final analysis, the brain processes a complex odor as a single object, not as a bunch of different molecules. If you get close enough to the natural target, the brain fills in the details. SH: I love how you discuss the power of smellscapes in your book. My most profound smellscapes are from my childhood in Phoenix, AZ: orange blossoms combined with sun-warmed cement with a cherry popsicle in hand, or the scent of hot dust from an impending monsoon storm, followed by the first drops of rain on hot asphalt and the smell of chlorine in my hair. Why are these smellscapes so powerful and what are some of your smellscape memories? AG: Funny how powerful smellscapes usually date from childhood—something that’s been confirmed in the lab. Maybe it’s because kids are encountering them for the first time, but it could be that we’re especially open to smellscapes at that age; almost a “sensitive period” in which we absorb all the sensory qualities of our environment. For me, growing up in another hot and dry locale—Davis, California—there’s a certain dusty, straw and thistle smell of the baked summertime fields that is very evocative. I like your mention of hot asphalt—just thinking about it takes me back to the endless hours I spent roaming around on my bicycle. Ditto for chlorine: I’m back at the campus rec pool, remembering people I haven’t thought of in years. Recently I’ve gotten to re-experience another childhood smellscape with my own kids: the hot rock and pine dust of the High Sierra, especially the Cal Alumni camp at Pinecrest, near Sonora Pass. Something about the altitude seems to sharpen the olfactory experience. SH: The most intriguing fact I gleaned from What the Nose Knows, is the existence of scented butterflies. You mention that the butterflies’ scents will vary from species to species and possess fragrances like vanilla, lemon and musk. This seems rife with possibilities for a perfumer in terms of inspiration as well as marketing. This is more of a comment that a question I suppose, but would you care to comment? AG: You’d think someone would have marketed a Butterfly Scent Series by now, no? I mean it’s a ready-made marketing concept. You could even analyze the scent with butterfly-friendly headspace techniques. The brief writes itself. When I was at Givaudan-Roure, I invited one of my grad school professors to pitch bio-prospecting in Costa Rica. Dan Janzen—a MacArthur Fellow “genius” and winner of the Crafoord Prize (biology’s Nobel)—helped start Costa Rica’s national park system and was looking for ways the local inhabitants could earn a living from their intimate knowledge of the ecosystem. He brought us specimen boxes full of butterflies, some of which had beautiful sweet scents. Unfortunately, I left the company before I could put a deal together. SH: You talk a lot about the sense of smell as an integral part of taste and experiencing flavor. But cooks and chemists have found that “sensory diversity is achieved with relatively few ingredients”. Can the same be said of perfumery? AG: In large part, yes. The evidence is those charts of “fragrance families” used to classify perfumes. You can cover most perfumes with a mere dozen or so fragrance families. Don’t get me wrong—there’s a lot of nuance within each family, and blending between families generates endless creative possibilities. But the point holds: the perfumer’s palette is relatively simple. Years ago I did a scent-sorting experiment with Sarah Kemp. The goal was to see whether natural odor categories emerge when people sort smells into groups—no verbal descriptions, no scoring system, just “put them together if they smell similar.” We saw evidence that groupings created by regular people resemble the perfumer’s fragrance families. We never got it published but it’s a project I’d love to revive. SH: You elaborate on Emily Dickinson’s love of cultivating fragrant flowers like mock orange, honeysuckle, and jasmine. I didn’t realize that in the 19th century these intoxicating flowers were too suggestive for the drawing room and were kept for her private enjoyment in the bedroom and at her writing desk. The image of these blossoms surrounding her in an intimate setting while writing is very poignant and speaks to me in regards to why I love the close-to-the-skin quality of natural perfume. With the abundant use of synthetics in perfumery, is it possible that we’ve lost some of that intimacy? AG: You might be on to something. I’d make an analogy to music. In Dickinson’s day people sang (harmony even! ), often around the piano. Chamber music, dance music, popular songs—it was all voice and acoustic instruments; anyone could pitch in. Music was personal and intimate. For several generations, pop music for us has meant massive electronic amplification. Big beats at a rave are one thing; but even weddings and bar mitzvahs are amped to the max. Intimacy is blasted out of the room. The big synthetics enable scent amplification; they’re great for making a big impression. For a while in the 80s perfumers went crazy with loud formulations: we were blasted by Giorgio and other blockbusters. Sanity returned with the swing of the style pendulum back to lighter, “transparent” formulas. I think you are right that naturals are quieter and allow a conversational experience between the wearer and the scent. SH: Another quote from your book really resonated with me when you were discussing the use of scent and marketing, be it in a hotel or department store. You said, “when a scent calls attention to itself, people feel obliged to decide whether or not they like it”. This is exactly how I feel about the Anthropologie signature scent. Whenever I step foot in an Anthropologie, I am fully aware of this scent, but haven’t figured out if I like it. Do you think your quote applies to personal fragrance as well? AG: Sure, insofar as a loud personal scent screams “look at me!” It might not be a distraction if it’s worn by an equally dramatic woman. But not everybody is Auntie Mame or Lady Gaga. SH: As illustrated in your book, genetic modification is now being used to enhance the scent of flowers and produce including roses and tomatoes. The use of GMO is controversial as environmentalists are concerned about potential negative outcomes related to genetic manipulation. Where do you fall in this debate? AG: We’ve been genetically manipulating plants since the domestication of wheat and other grains about 15,000 years ago. It’s what got us edible potatoes, corn, and rice, not to mention citrus and stone fruit. Just because we do it via gene transfer rather than old fashioned cross-pollination makes no difference to the resulting hybrid. Some people worry that an inserted gene might “jump” to other, less desirable species. But genes jump all the time—a species’ genetic boundaries are quite porous—and countervailing natural selection keeps things from getting out of hand. I think the “Frankenfood” scenario is a ridiculous one cynically promoted by the enviro lobby. When the “greens” convinced hungry nations in Africa to refuse US corn because it has a useful gene, their moral preening cost people their lives and health. On a happier note, why shouldn’t we use biotech to restore the natural scent to a rose that our ancestors bred out of it? SH: This last question is out of sheer curiosity. Do you wear fragrance, and if so, which ones are high on your list of favorites? AG: For obvious reasons I prefer to stay mum about what I wear; I don’t wear when writing or doing data because it keeps calling attention to itself. (Maybe it’s just me.) I’m not particularly fond of aldehydics, but I’m a sucker for a woman who can wear a big Oriental. In addition to being an author, Avery Gilbert is also a blogger. You can find him at the First Nerve. Ah! I loved reading this! I believe I have taken a lot from reading this and many parts of this interview will stay with me. The part about the scented butterflies grabbed my interest the most! This is something I would like to know more about! Thanks Justine, glad you enjoyed it! I enjoyed “What the Nose Knows” very much, and got a chance to chat briefly with Avery Gilbert at a Sniffapalooza in NY when it was newly released. Nice to see your interview, and learn more. Having read this interview I’m going to put Avery’s book on my summer reading list. Great stuff and really fascinating to find out about the childhood impact on smell. I love Avery — he’s one of the warmest, wittiest conversationalists I’ve met in perfume-land. An interview with him is always a pleasure to read. Thanks, Trish, for getting this together and published. Both great questions and entertaining answers. What a great dialogue between you two! The smell of chlorine blasts me back to a time when I was young and (somewhat) fearless…great memories. I love Scent Hive and look forward to new posts! Also, it’s a great reference when looking for reviews on natural scents. Keep up the great work! Thank you for your perspective Devon. It’s good to look at this from all angles so we can make informed decisions about what we buy, eat, use, etc. Absolutely fantastic discussion Trish, thank you for this! I had the opportunity to sit with Avery at a Sniffapalooza luncheon in NYC, what a treat he and his book are. I just found Butterfly on the DSH site, it sounds beautiful! Thanks for the tid bit about the owls…dreamy imagery! I really enjoyed this- and had no idea he had a blog so thanks very much as always- enjoy your holiday! Another wonderful post from you Scent Hive ! Makes for some food for thought – fascinating stuff re the butterflies. Great site! I love this! Just joined the site and look forward to heading back for a few more ideas and a little inspiration.